Do you like EnginExcel free material? If so, subscribe to the newsletter and get to know when a new free spreadsheet is available. Nowadays, most applications in mechanical engineering include a servomotor. Servomotors are relatively cheap and provide great precision and flexibility, especially if compared with more traditional methods like cams. I don't like to perform iterations, since I think that the human mind is made for something greater than that. Also, I found myself creating a new spreadsheet/sketch/calculation every time a project needed the sizing of a servomotors, bringing to a big frustration for the loss of time. Include the whole process of calculating the load (either linear or rotary) of an application, including the motion profile definition. Give the possibility of selecting the motors and gearboxes from a defined list, avoiding the hassle of looking through the suppliers websites. Provide the user with a list of results by only clicking a button, avoiding all the iterations needed for the "classical" approach. Allow to filter the results depending on the desired parameters, may it be the overall weight of the motor/gearbox, the torque, the current needed, etc. The Servo motor sizing apreadsheet includes all the features needed to size a system from beginning to end. The user starts by defining the motion profile: if the acceleration and speed of the system are already known, they can be inputted directly. Otherwise, the user can define a motion profile including up to 6 reference points. The profile can either be selected for an application which has to move between different speeds or different positions. The calculations are done on a linear or rotary basis, depending on the designer specification. Finally, the acceleration is calculated selecting from various profiles available (E.g. trapezoidal, sine wave, etc). After the parameters are inputted, the spreadsheet automatically calculates the torque needed for moving the load with the defined motion profile. These values are show in the load page and also summarised in the main page. The following step is the setting of the belt drive. In the apposite page it's possible to choose if the belt is present and define the pulleys diameters and the overall inertia. The speed, acceleration and torque are automatically updated to the motor side of the pulley. The user can then define the safety factors to be used in the calculation. 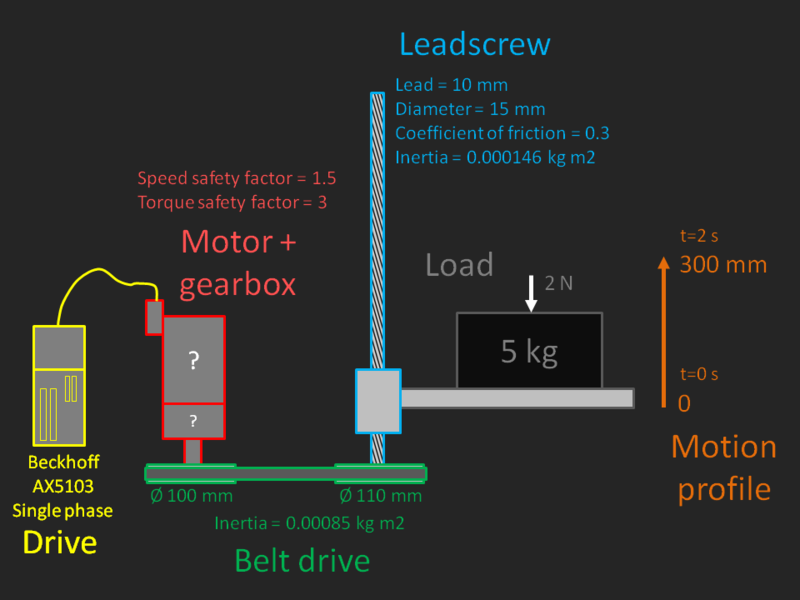 It is possible to input the safety ratios related to torque and to speed. All the servos and gearboxes with a safety ratio lower than the one defined will not be considered as acceptable results. Finally, the designer can select the drive that will power the motor. This can be picked from a drop down list. As an alternative, the maximum available current can be manually inputted or ignored. At this point the spreadsheet is ready to calculate which combinations of motors/gearboxes will be suitable for the application. When the user presses start, the all the combinations of servos and gearboxes are evaluated, including the condition where the motor is connected directly to the load. For each combination, the torque needed to accelerate the motor and the gearbox is added to the one needed to accelerate the load. The resulting torque and speed are compared to the one achievable by each motor. If the safety ratio is higher than the one specified, the resulting combination is fully calculated and listed in the results table. Here the user can filter all the resulting combinations depending on the parameter that he is interested in. Servo motor sizing spreadsheet is tested on Microsoft Excel 2007, 2010, 2013 and 365 for Windows. Microsoft Excel for Mac is currently not compatible. How to know which fields the user can input The user can input data in all the cells with black text. All the cells coloured in dark green cannot be edited, since they are the results of a calculation. Where to start inserting the data - Go to 'Summary' sheet. - Start from the "1. Load motion profile" area. - Click on the "1. Load motion profile" title, which hyperlinks to the motion profile page. - Repeat the procedure following the arrows. How to know if enough data has been inputted - Go to 'Summary' sheet. - Look at the top-right corner of each box. - If a green tick is shown, enough data has been inputted.- If a red cross is shown, some data still has to be added. In this case, click on the hyperlink to the page and input the missing data. Define the motion profile of the load - Go to '1. Load Motion profile' sheet (or follow the hyperlink from the 'Summary' page). - Go to the cell marked as 'START' and select form the dropdown list how you want to calculate the motion profile and which type of load is used.- Depending on the choice, a set of cells will become visible. - Insert the data required.- When all the data is inserted, the maximum acceleration and speed of the load will be shown in the area marked as 'Summary' at the top right of the page. Define the load (if rotary load has been selected from the motion profile page) - Go to '2. Rotary load' sheet (or follow the hyperlink from the 'Summary' page). - Insert the constant torque applied to the load. - Insert the inertia of the load.- When all the data is inserted, the torque due to the load will be calculated and shown in the area marked as 'Summary' at the top right of the page. Define the load (if linear load has been selected from the motion profile page) - Go to '2. Linear load' sheet (or follow the hyperlink from the 'Summary' page). 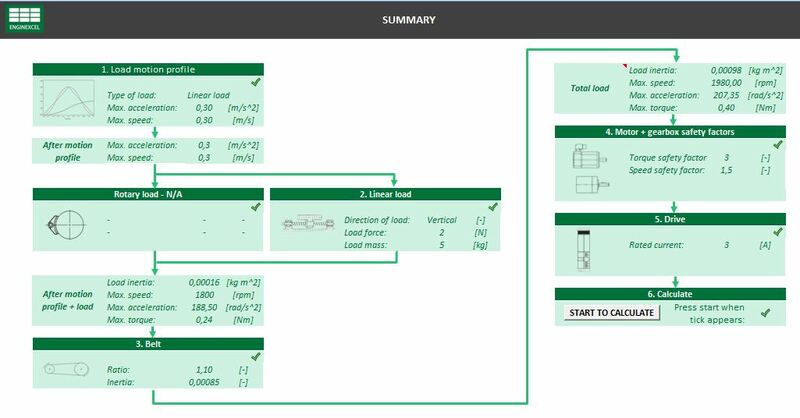 - Insert the data regarding the load and the leadscrew.- When all the data is inserted, the torque due to the load will be calculated and shown in the area marked as 'Summary' at the top right of the page. - The velocity and acceleration of the end shaft of the leadscrew will also be shown. Define the belt - Go to '3. Belt' sheet (or follow the hyperlink from the 'Summary' page). - Insert the data regarding the belt.- When all the data is inserted, the torque at the motor side of the belt will be calculated and shown in the area marked as 'Summary' at the top right of the page. This torque will include the torque due to the load.- The velocity and acceleration at the motor side of the belt will also be shown. Define the safety factor to use when calculating the motor and the gearbox - Go to '4. Motor + gearbox safety factors' sheet (or follow the hyperlink from the 'Summary' page). - Define the speed safety factor (how close the maximum speed on the motor is allowed to be to the maximum allowable speed of the motor).- Define the torque safety factor (how close the maximum torque on the motor is allowed to be to the rated torque of the motor). Define the drive that will power the motor - Go to '5. Drive' sheet (or follow the hyperlink from the 'Summary' page). - Go to the cell marked as 'START' and select how you want to calculate the drive maximum current.- When the choice is completed, the maximum current allowable from the drive will be shown in the area marked as 'Summary' at the top right of the page. - Go to 'Summary' page. - Check that a green tick appears in the '6. Calculate' area. If not, make sure that all the data has been inserted correctly. - Click on 'Start to calculate'.- The spreadsheet will ask a confirmation to erase the results of the previous calculation. Press 'Yes'. - The calculation will start: the status of the calculation will be shown on the status bar on the bottom left of the spreadsheet. - After the calculation is completed, the results page will be automatically shown. - It is possible to filter/order the results using the filter buttons at the beginning of each column. Review/complete the motors list - Go to 'Motors list' sheet. - All Beckhoff servo motors are already recorded in the spreadsheet, but more spaces are available if the user wants to add motors from different suppliers. Review/complete the gearboxes list - Go to 'Motors list' sheet. - All Beckhoff gearboxes are already recorded in the spreadsheet, but more spaces are available if the user wants to add others from different suppliers. How to see the formulas used for calculating the torque on the motor Go to 'Maths' sheet.